It is night, and the only thing filling the sky is lightning and earth shattering thunder. The crews are almost finished with their seasons of crab fishing and the end of the road could not be any closer, but Captain Campbell and Captain Hillstrand are not about to let a small storm ruin their chances at finishing the season strong.The two captains are both having issues with weather and a few bad strands of fishing spots. Captain of the 109 foot Seabrooke, Scott Campbell Jr. is eager to gather enough crabs to finish the fishing season. 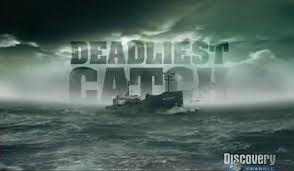 Before today I have never actually watched an episode of deadliest catch. I would have to say that I thought that the show was very interesting and intense. The two captains have to keep watch and keep safe there whole crew. I realized that crab fishing is dangerous and tiresome. The waves beat against the boats as they drive out into the ocean. Captain Scott Campbell Jr. is a rough and tough captain who wants what is best for the members of his crew. I watched episode 10, season 4, and during the show Captain Campbell was faced with a horrible storm and he had to decide whether or not to turn his boat around or keep pushing forward. With the crews best interest at heart he made the correct decision to get the boat to land to wait out the storm. Trying to gather as many crabs as they can on their way back to the main land Campbell is pained by the issues he is having with his back. The wind gusts were up to a raging 70 miles per hour. Although the weather was not in their favor they pushed through for 8 hours and gathered 143 crates of crabs. The crew rejoiced with excitement for a great nights catch. The captain nears land and finished for the sake of the crew even though his back was injured. Worried that they would not be able to meet their goal of king crabs Captain Campbell tries to push his team through the waves in the Barring Sea so they can collect as many crabs as possible as their season ends. During the storm before they could call it quits they had to gather 140 pots full of crabs. The men on the deck received a large amount of 18,000 dollars a piece, for the hard work they put in. 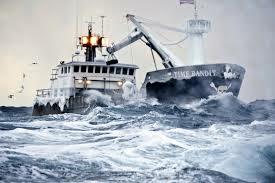 Captain Jonathan Hillstrand is captain of the 113 foot boat Time Bandit has been having bad luck with crab and poor weather conditions for over a week. They have to get as much crab as they can to have enough to meet their goals. At this point in the season the crew is not even close to the amount of crab that they need at turn in. They have been pulling up plots of only one and two crabs at a time. The lack of crab is making it very hard on the crew and is crushing their spirits. Captain Hillstrand is teaming up with the captain of the Northwestern to share in his glory of the crabs he is picking up. Both captains are going to work together to keep the other fishers out of their area. The captain believes that his decision was a good one but the crew may not agree with his choice. I decided to watch two completely different episodes for my second show because i wanted to make sure I was able to understand the season. What I noticed about the two captains was that Captain Campbell was very independent and could handle his crew without relying on someone else to help him with his troubles unlike Captain Hillstrand did. Captain Campbell pushed his team hard, but I think that Captain Hillstrand was the toughest on his members. Seeing as I haven’t seen but the two episodes I watched I had a hard time figuring out the captains strategies about how they controlled their crew. In my opinion captain Hillstrand was more dominant than the surrounding captains I noticed that his crew worked better together because there was not as much strain on the team. In conclusion, the Seabrooke is going to have a better outcome for their seasons ahead, because of the way he treats his crew members. The crew members benefit from the captains strategies because they work as a team rather than competing.